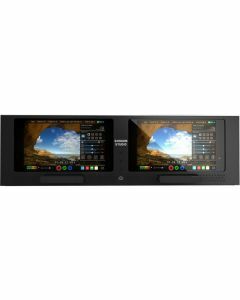 The Atomos Shogun Studio is the world's first all-in-one 4K, HD, 2 Channel, Dual 7 inch 3 U Rackmounted Recorder, Monitor and Playback deck. Harnessing the latest recorder, monitor and playback technology with class leading Atomos usability and affordability, the Shogun Studio has everything needed for Live Event, On Set and Broadcast professionals. The new wave of 4K cameras from Japan are arming the Pro Video world with amazing sensors at affordable price points, but falling short when it comes to Recording & Monitoring capability. Shogun completes the solution for professionals, with a class leading 7" high resolution monitor, Balanced XLR audio, HDMI & SDI connectivity, Recording direct to 422 10-bit ProRes and all to high capacity, affordable and open market SSD's. 4K, 1080p60 recording to popular professional codecs. Utilize the 2 channels for dual codec, dual resolution recording. Scheduled playback and record via Ethernet, Serial & on-screen. Class leading monitors & test measurement for perfect 4K viewing & set up on build in HD monitors. Powerful & intuitive AtomOS offers one touch simplicity for any operator. Utilize the Atomos Master Caddy for reliable, affordable open standard media. Continuous build in HDMI and SDI convertor with down scaling for 4K to 2K/HD match you infrastructure. Dual IEC c14 PSUs to integrate with your rack power distribution system. Dual channel: Record 4K master with HD proxies. Record both ProRes & DNxHR versions, independent dual channel record. Custom timelapse: Yes (Key frameable up to 10 video and single frame Intervals, can be triggered from internal clock).